Should you put a tape or a sticker over the lens of your laptop’s webcam? Yes, even Facebook CEO Mark Zuckerberg and FBI Director James Comey do that. Covering your laptop’s webcam might be a hell cheap and good idea to guard against hackers and intruders who might want to watch your private life and environment through your devices. In fact, Comey recently came out defending his own use of tape to cover his personal laptop’s webcam. "Heck yeah, heck yeah. And also, I get mocked for a lot of things, and I am much mocked for that, but I hope people lock their cars… lock your doors at night. I have an alarm system. If you have an alarm system you should use it, I use mine." Comey went on to explain that it was common practice at the FBI and other government offices to cover computers and laptops’ webcams with tape or any physical cover. "It’s not crazy that the FBI Director cares about personal security as well," he continued. "If you go into any government office, we all have our little camera things that sit on top of the screen, they all have a little lid that closes down on them, you do that, so people who do not have authority don’t look at you, I think that’s a good thing." Comey believes that putting a cover over webcams is one of the "sensible things" that everyone should be doing to "take responsibility for their own safety and security." While this practice is often made fun of, tapping your device’s webcams is a good take away for you to adopt. We know the FBI and NSA’s ability to spread malware and turn on device’s webcam to spy on targets. Edward Snowden Leaks revealed the NSA’s Optic Nerve operation that was carried out to capture webcam images every 5 minutes from random Yahoo users, and in just six months, images of 1.8 Million users’ were captured and stored on the government servers in 2008. However, putting a tape over the lens of your computer’s webcam would not solve the problem, especially in this era when we are surrounded by so many Internet-connected devices that are a security nightmare. Due to the insecure implementation, these Internet-connected or Internet of Things (IoTs) devices, including Security Cameras, are so vulnerable that hackers are routinely hijacking them and using them as weapons in cyber attacks. So, it is far more easy for hackers to hack your security cameras, instead of your laptop’s webcam, to keep track on you and your environment. 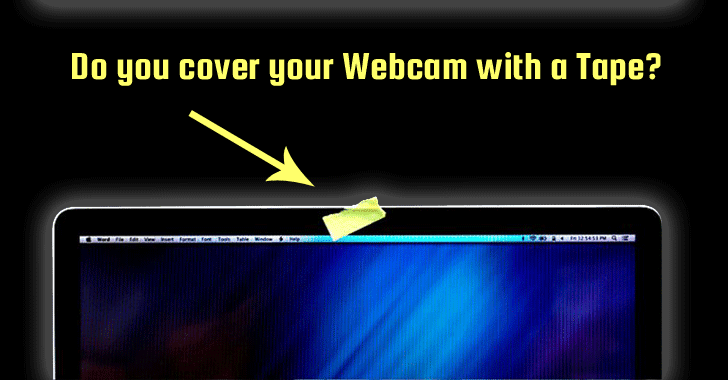 Do you feel the need to use a tape over your webcam? Let us know down in the comments.